We have always been personified as one of those upscale restaurants. In some ways, it is a false pretense. Although there is nothing wrong with having that look and feel, we believe there really is something for everybody when it comes to our menu. And we feel we create just as much value and variety in our featured specials each week. I mean, think about it. We all know the Red Door has been closed for a while now. If you've had the pleasure of dining there, remember how great it was? For those that had never been, this is your chance to taste one of the originals. We do it just like they did for only $18. Remember, it has been Victor Approved. The price even almost dates back to the Red Door times. Many people have never tried a fish taco. Trust us, it is something you do not want to miss. Three soft shell tortillas filled with FRESH panko crusted whitefish. This is not a fish stick you find everywhere else. This is fresh whitefish that comes in every week, and we hand bread them. We then fill each taco with fresh mango, strawberries, red pepper and cilantro. Everything is fresh. The look alone is amazing, but wait until you try the flavor combination! Come any other day and pay the full price of $13. Authentic German fare ...and not just in September or October. Know that you can stop down any Wednesday evening and get a plate of veal cutlets topped with a demi glaze, fresh roasted asparagus and spaetzel for only $13. Just say "Burger Me," and where else will you be able to get a gourmet burger where each week we create an interesting, unique, and flavorful combination served with any beer - bottle or 16 oz. draft - all for only 10 bucks?! I will be honest, some combinations might sound like they wouldn't work, but I have yet to try one I haven't liked. We serve Prime Rib like it should be served. Herb crusted and slow roasted in a 1970 alto sham. This oven creates the perfect cooking technique for prime rib. How many places have you been to where it is almost like they microwave it to order. Not here. Our prime gets the attention it deserves. Slow cooked all day to get the most tender cut of meat around. Calling all lamb lovers! Every week, we slow roast a leg of lamb and serve it with a mint demi glaze. Where else can you find lamb every single week? All the hype goes into this annual Hollywood event. We pay more attention to it each week. Have an Oscar Sunday every Sunday of the year with your choise of the following Oscars. 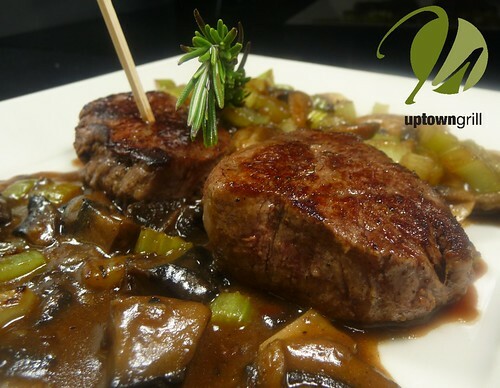 Our nominees include: new york strip, grouper, veal, mushroom or chicken. Your choice is served over a bed of seasoned rice blend, roasted asparagus, real lump crab meat and hollandaise for only $13. As you can see, there has to be something for everybody when it comes to our weekly specials. We hope to see you soon!